Foliage: Long banana-like leaves and grow from 3 to 6 feet tall. Simple, entire, with sheathing petioles. Leaves may be green, blue-green, bronze or purple; sometimes white, pink or yellow variegated. Flowers: Slender flowering stems emerge at the top with clusters of assymetrical, showy inflorescences. Bloom heavily between July and October in large clusters, with flowers ranging from white, orange, yellow, pink, red and bicolors. Deadhead to prolong blooming. Culture: Full morning sun. When planting in the spring after the last frost, plant the rhizomes just deep enough to cover with soil, and space them about 1 foot apart. May survive winters in zone 6 with mulch. Rhizomes may be dug up in autumn and stored until spring. 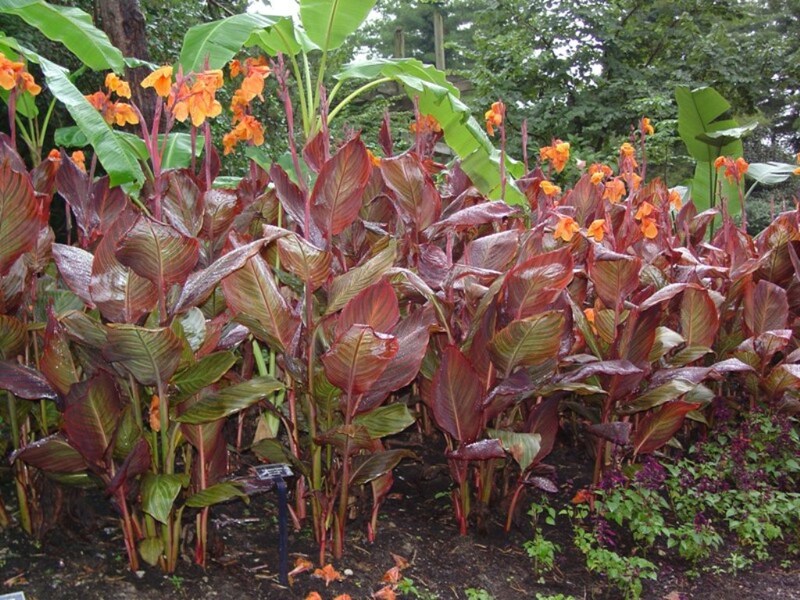 ‘Bengal Tiger’ - The dramatic stalks of green-and-yellow-striped leaves with a brilliant maroon edge grow to 6' and are topped in summer with bright orange flowers; shown at right with purple-leaved cannas behind.